Alan Warshaw, a Palo Alto, California resident with a background in product management and marketing, has come up with The Magic Yad, a new smart pen that, in addition to writing, chants the Torah and Haftarah portions of the week. The pen uses a new technology called Livescribe that links audio to handwriting. Warshaw co-founded the company last year with his friend Alan Greenfield, who lives in Needham, Mass. The Magic Yad looks like one of those fountain pens kids used to receive as bar mitzvah presents. In fact, it is a five-inch pen, in that you can actually write with it. But this is the RoboCop of pens. 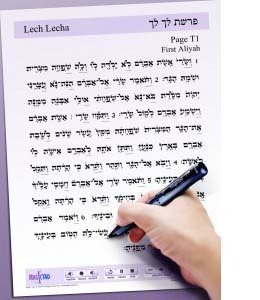 Retailing for $150, the Magic Yad coordinates digital audio stored in the pen with Hebrew writing on special pre-printed paper — thus helping b’nai mitzvah students nail their Torah portions. Though the Magic Yad looks conventional, it is anything but.An infrared camera in its tip “reads” anywhere from a single phrase to a b’nai mitzvah student’s full Torah portion. Reads? Actually, the yad (the name for a pointer that Torah chanters use to follow the Hebrew text) picks up a dot pattern that is invisible to the naked eye, which triggers a recitation of the passage stored in the pen. 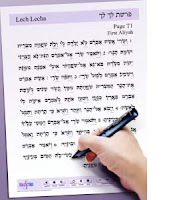 The special Torah portion paper also has icon buttons printed at the bottom; users can tap the Magic Yad on “record” or “play” or “speed up” or “slow down,” as well as other functions. The Magic Yad works only with booklets of Torah and Haftarah verses that have been specially printed for use with the device. Prices range from $60 for a third of a parsha to $120 for a full parsha with seven aliyot. The Haftarah costs another $120. The voice emerging from the pen is that of Cantor Gaston Bogomolni of Temple Aliyah in Needham, Massachusetts. You can customize the reading with the voice of your own cantor or teacher, but that will double the cost of the software in most cases. To see the Magic Yad in action, just click on the video below.